Happy Christmas Eve, loves! Apologies for the later post time today. It's been such a crazy holiday season, trying to finish up the last finals of my undergrad career AND get holiday shopping done. I've been spending today trying to get organized--packing to go home, paying bills, finishing up last minute holiday errands...can't believe that it's already the end of the year again! I swear, each year passes faster and faster as we get older...a reminder to savor small moments because it's the small ones that make up all the good times. Despite the craziness that ensues at the end of a semester (especially this one since I'm graduating! ), I set aside a little bit of time to head uptown and see all the Christmas festivities. 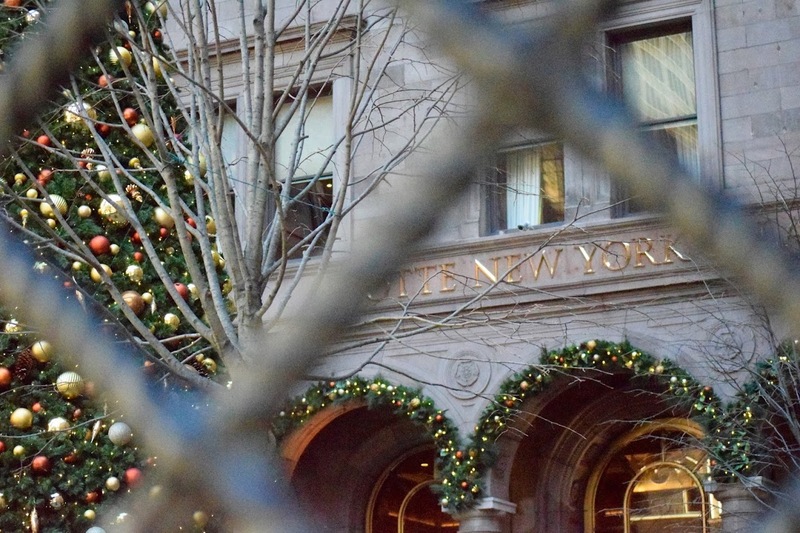 I've always wanted to visit the amazing Christmas tree that the New York Palace puts up every holiday season, ever since I watched Gossip Girl in high school. It was unreal to see this amazing tree, the centerpiece of their plaza, along with all the other holiday decorations. The minute I set foot in that plaza, everything else melted away. All the little things in the back of my head, the nagging feeling of still have that paper to write or exam to study for just disappeared. I couldn't help feeling a bit awe-inspired just staring at this magnificent Christmas tree. Getting all dressed up is one of my favorite part about the holidays. 'Tis the time where you can pull out the sequins and the fur and get all glammed up without feeling a little bit ridiculous. When it comes to the holiday season, I let my wardrobe run a little wild. First time styling a faux fur accessory and I'll admit, it definitely felt a bit odd and out of place. I was super bundled and warm because of it (thank god, cause it was freezing that day), but I couldn't help feeling a bit over the top. In terms of the overall look though, I think it really pulled everything together. 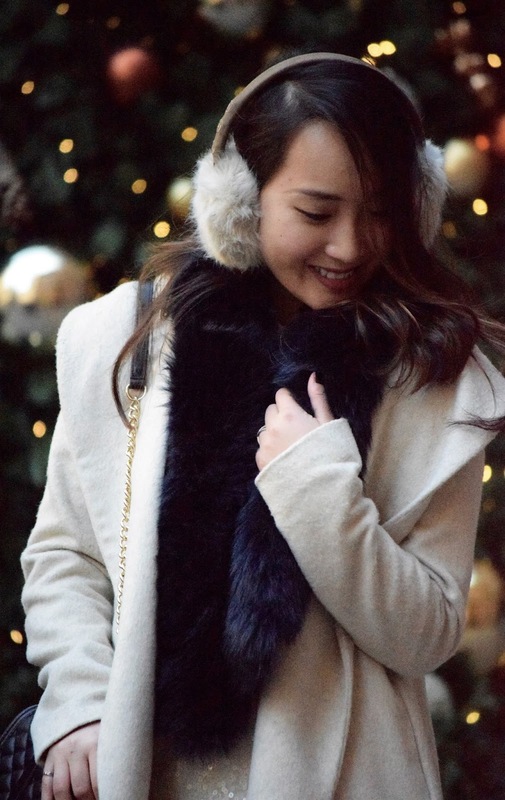 Not to worry, I'll be thinking of more creative ways to wear this fur stole for the rest of the season! 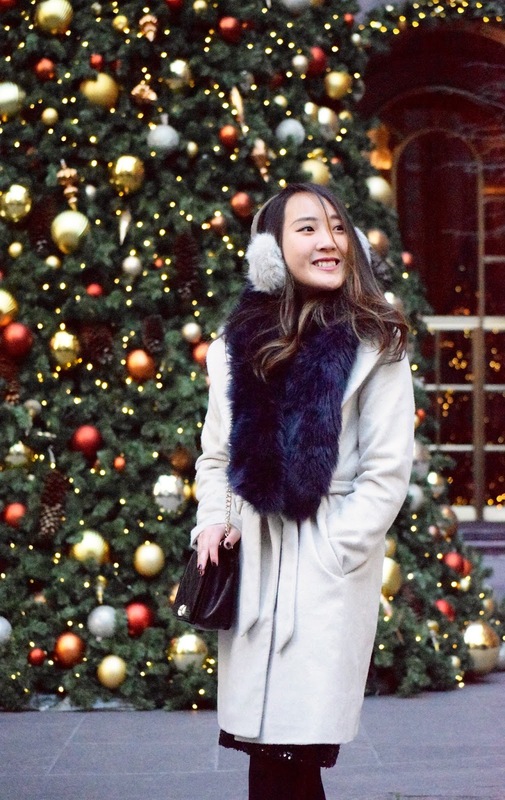 This is the look I'd be headed out in to take on all the New York City holiday traditions. 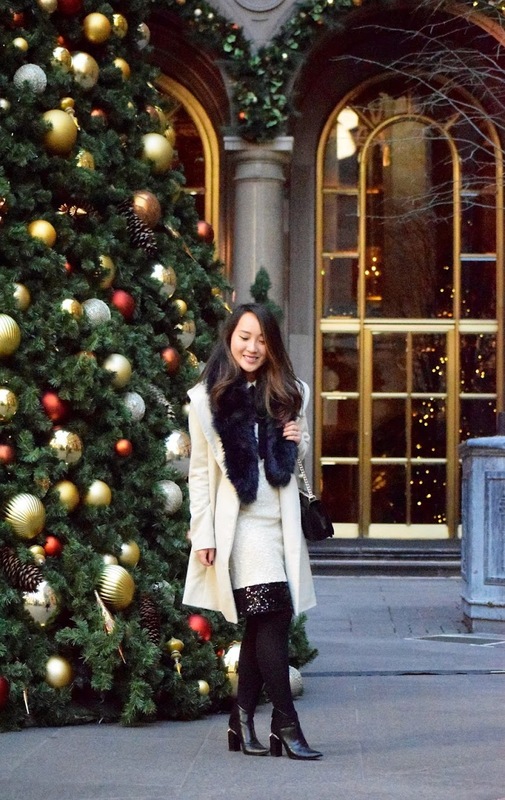 From tree lightings to watching the Rockettes at Radio City Music Hall to window shopping those 5th Ave department store displays--you'll see a whirl of sequins as I take on the city during the holidays. Best of 2015 Round Up + Hello 2016! Boxing Day Deals & Steals! Top Gift Picks this Holiday Season!